This legendary variety is one of the world’s hottest peppers coming in at a staggering, eye-brow singeing 2,200,000 Scoville units. In comparison, a jalapeno comes in from 2,500 to 10,000 Scoville units. They are wrinkly and have a scorpion like tail. As you first taste these bright red peppers, you get a fruity sweet chilli flavour that is quite tasty. The heat kicks in after around 30-40 seconds and can linger for up to 30 minutes. Growing tip: depending on the area pollinator population, pollination by hand may be needed. Watering less during the fruiting stage will produce smaller peppers but it will increase the heat. 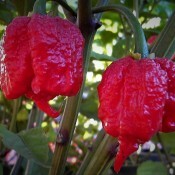 Carolina Reapers can be harvested when they are green in colour. If you’re looking for that full bodied flavour and a more intense heat, then it is better to wait until they reach the red colour stage. Use a sharp knife or pruning shears to snip off peppers leaving a short stem attached. Always wear latex/nitrile gloves when handling these peppers and avoid contact with the face and eyes. Keep out of reach of children and pets. Peppers tend to be light feeders so the addition of a slow release fertilizer such as 5-10-10 at the time of planting will be sufficient. Once blooms start to form, side dress the plant every 2 to 4 weeks with a potassium-rich fertilizer.